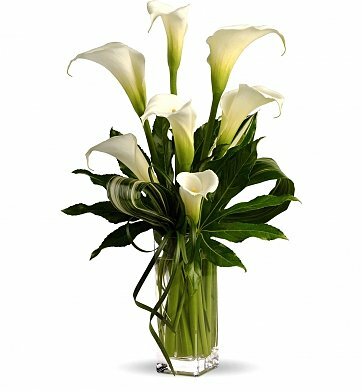 Impress your fair lady with this premium arrangement of pure white calla lilies dramatically accented with tropical leaves. Measures approximately 15" x 24". My Fair Lady Bouquet is a hand delivered gift. These gifts are delivered by one of our local design centers located throughout the United States and Canada. Same day delivery is available for most gifts when ordered before the cutoff time. The cutoff time for My Fair Lady Bouquet is 2 PM in the recipient's time zone. I bought this for a special girl and she was ecstatic when these were delivered on her doorsteps. It's a great buy and the arrangement was better than pictured. Definitely recommend to anyone. I was told by more than one person that it was beautiful. I am pleased. Had some delivery issues but they took care of everything. I would do it again.